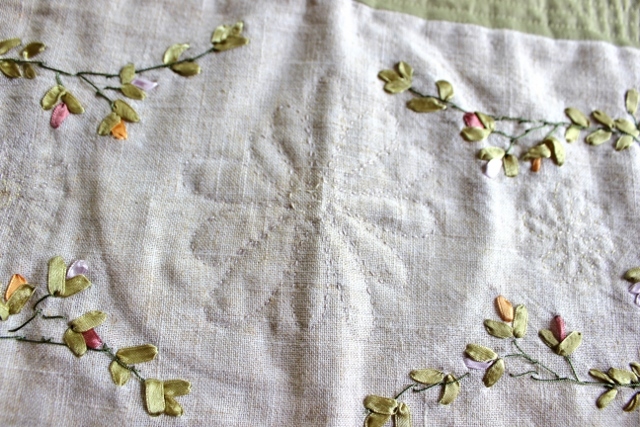 Last May, I decided that our table runner needed some help. I had brought it home as a souvenir of our amazing trip to Greece in 2008. I loved the ribbon embroidery on it and using it brought back all those great memories from that trip, particularly of Thassos, the island where we bought it. Unfortunately, it also really annoyed me because it would never lie flat. The outer layer of fabric had been sewn on incorrectly and it didn’t matter what I did, it always looks a bit messy. Linen is even more finicky than flannel. Talk about impossible to keep straight! It sat for almost a year until I picked it up sometime in April (purely because it was on my list), and started hand quilting on some flowers. I have NO idea what I’m doing with hand quilting. I have no idea how you make the back look as good as the front. Luckily, the back of mine will never see the light of day. So here it is, in its unwashed, wrinkled, and way imperfect glory. The two left corners don’t even lie flat – boo hoo. That section is my favorite of the ribbon embroidery! There’s the imperfect back, where you can at least see what I sewed. I’m going to wash and dry it and hopefully it will shrink up some and look less wonky. And then I’ll probably put it away and never use it. Or maybe I will. We’ll see. Anyway, it’s done and off my list of projects hanging over my head! This is my entry for Finish it Up Friday at Crazy Mom Quilts. I only have one more item on my list and I”m happy to report we’ve seen some progress on that front. Hopefully, I’ll have something to show in the next couple weeks! This entry was posted in Greece, sewing and tagged Finish It Up Friday. Bookmark the permalink. 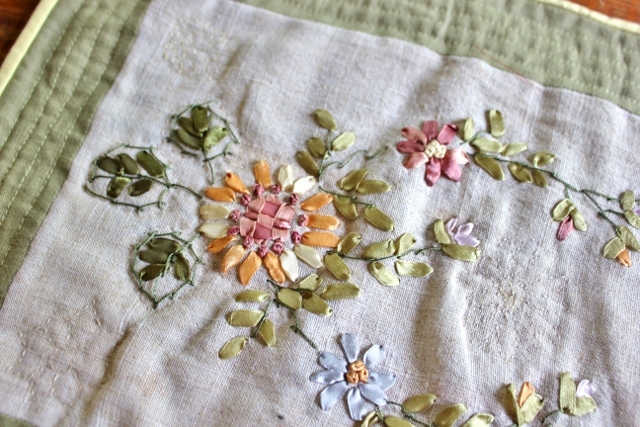 Your runner is lovely with your special quilting and I love the green border which enhances it nicely! I hope you can enjoy it and not worry about it laying flat. It’s funny because sometimes I just enjoy the sweet charm of a project despite its flaws and other times I’m just too irritated. Thank you Sheri! I’m trying to just enjoy it but yes, sometimes it’s hard to get past the irritation! It is pretty as it is but I understand your frustration. Quilting stitches will always make work kind of shrink a bit so you would need to quilt the same density if not the same pattern all over for it to sit flat. Hi Liz! Thanks for your comment. The problem with this particular project is that the ribbon embroidery section shifted inwards when I quilted the outer section. So there’s too much fabric to quilt the same density all over the middle, without folding over sections of fabric. It’s the outer corners that won’t lie flat, which are quilted at the same density and that’s what was most frustrating to me. In the end, it was a learning experience and I’ll still probably end up using it periodically throughout the year. 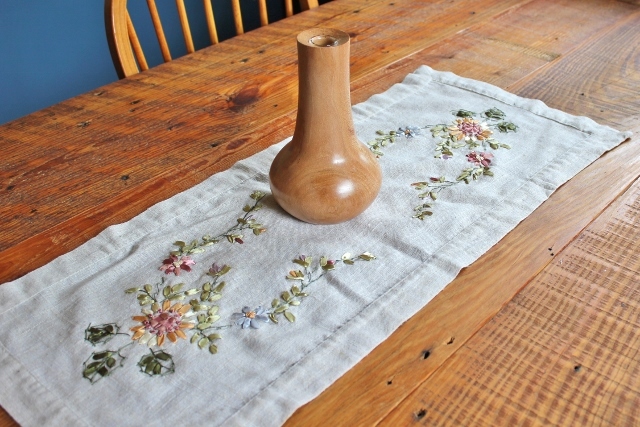 It is a very lovely table runner. I give you three cheers for your bravery in even attempting to take it on as a project.